TITLE II of the Public Law passed by the 96th Congress to establish the Langmuir Research Site is transcribed below. Other sections of the law not pertinent to Langmuir Laboratory are not included here. To designate certain National Forest System lands in the State of New Mexico for inclusion in the national Wilderness Preservation System, and for other purposes. SEC. 201. 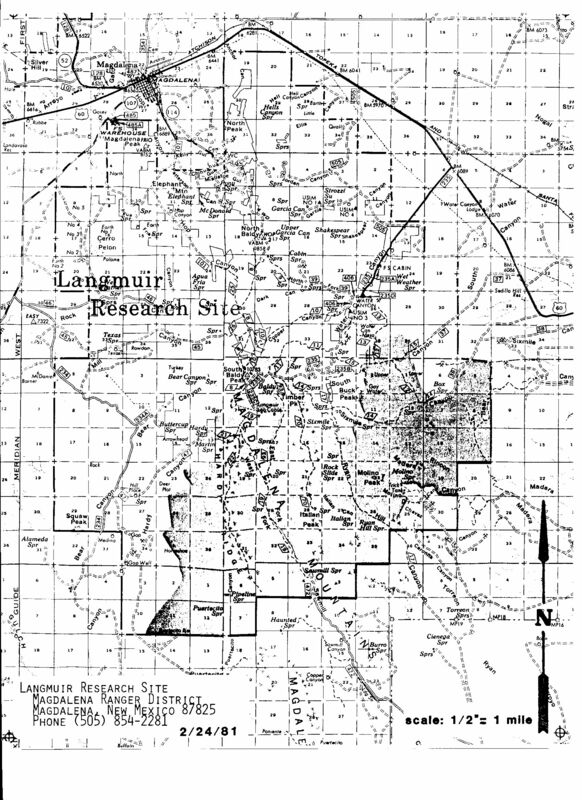 That in order to encourage scientific research into atmospheric processes and astronomical phenomena, and to preserve conditions necessary for that research, there is hereby established the Langmuir Research Site (hereinafter referred to as the “research site”) in the Cibola National Forest in the State of New Mexico. SEC. 202. The Congress finds that the high altitude and freedom from air pollution and night luminosity caused by human activity, make the research site uniquely suited to the conduct of research probes into thunder clouds and for other atmospheric and astronomical research purposes. SEC. 203. The Secretary of Agriculture shall administer, protect, and regulate use of the research site in accordance with the laws, rules, and regulations applicable to National Forest System lands, and in such manner as will best contribute to purposes of this Act. SEC. 204. The Secretary of Agriculture in furtherance of the purposes of this Act, is hereby authorized, and directed, to enter into an appropriate land use agreement with New Mexico Institute of Mining and Technology for the Langmuir Research Site for the purpose of establishing conditions for use of the national forest land, and to set forth working relationships during such period of use. SEC. 205. (a) The research site shall consist of approximately thirty-one thousand acres, including a principle research facility of approximately one thousand acres. The boundaries are depicted on a map entitled “Langmuir Research Site,” dated August 1980, which is on file and available for public inspection in the office of the Chief, Forest Service, United States Department of Agriculture. (b) As soon as practicable, after enactment of this Act, the Secretary of Agriculture shall develop a comprehensive management plan for the research site consistent with requirements of the national Forest Management Act of 1976 (Public Law 94-588) (16 U.S.C. 1604), which shall be incorporated into the initial Cibola National Forest land and resource management plan as provided for under that Act. (c) Following timely notice in writing to the Committee on Interior and Insular Affairs of the House of Representatives and the Committee on Energy and Natural Resources of the Senate of his intention to do so, the Secretary may make minor adjustments in the boundaries of the research site to provide for more effective management or to encourage further research activity. For the purposes of this subsection, minor boundary adjustments shall not increase or decrease the amount of land within the research site by more than seven thousand acres. (d) In developing the plan, the Secretary shall consult with the National Science Foundation, the New Mexico Institute of Mining and Technology, the New Mexico Academy of Science and appropriate conservation, wilderness, wildlife, industry, and other public interest groups. (e) The plan shall prescribe specific research and management objectives necessary for the protection, management, and regulation of the research site as outlined in the subsection (f) of this section. (1) The principal research facility shall be managed primarily for scientific research purposes. Dispersed recreation, grazing, and other uses which the Secretary determines to be compatible with scientific research may be permitted. (2) The research site shall be managed to enhance scientific research objectives. Scientific research activities and associated research equipment and structures shall be permitted within the research site in accordance with the plan. (3) Roads shall be limited to those necessary for scientific research activities and other reasonable activities as determined by the Secretary. Motor vehicle use shall be restricted to roads designated in the plan. (4) The landing of small instrumented research rockets shall be permitted to continue in portions of the research site designated for such purposes in the plan.